Yup, that's what it is. 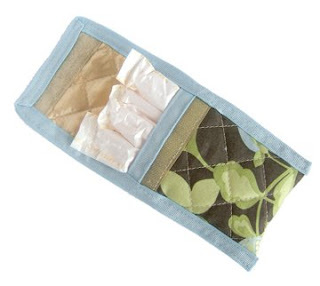 A discreet way to carry those personal sanitary items in your purse without being discovered by nosey purse peekers. (I got one of these when I was like 15 and I've used it ever since). 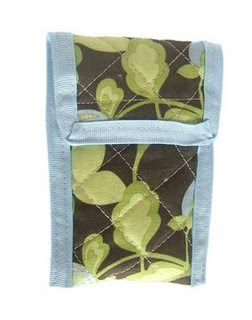 Cotton fabric with batting in the middle, a slickery inside material for easy gliding, and a velcro closure. 1. It's about 1/2" too wide. Make it a little narrower. It really only needs to hold 3 tampons. (It also fits pantiliners). 2. Don't bother "quilting" the fabric. 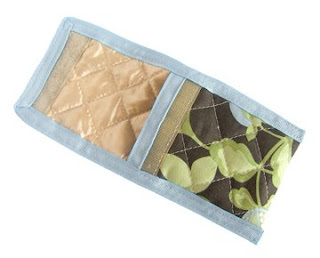 And if I do quilt it again, use a more subtle thread color. 3. Less contrast. It's a small enough item that I don't think the contrast is working with this size. If I were to re-do this one, I'd use a green or brown trim. 4. Pick trim ribbon first, then fabric. I used blue grossgrain 7/8" ribbon, and it's a little brighter in real life. I toned it down in these pictures so it would look better. Ribbon colors in the correct size are quite limited, so it might be easier to match a fabric to a ribbon, rather than vice versa. My sewing is a bit lopsided as well, but that will come with practice (I hope!). All in all, I think it's a worthwhile item, and I think I'll make some more to sell on my Esty site (opens August 1st).